Recent Walmart store closings are not due to plumbing issues or even military exercises as some have speculated. According to the United Food and Commercial Workers International Union, the closure of five stores is a response to labor activism at a store in Los Angeles. The union has filed a claim with the National Labor Relations Board and wants the government to force the corporation to rehire employees laid off during the closings. 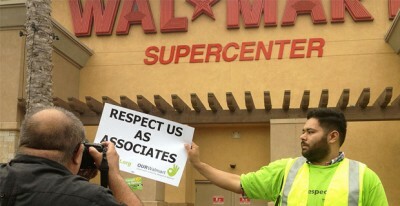 “Walmart has targeted this store because the associates have been among the most active associates around the country to improve working conditions,” the union claim states, according to The New York Times. According to the Fortune Global 500 list in 2014, Walmart is the world’s largest company by revenue. In 2012 five million Americans applied for 500,000 Walmart jobs. The company employees 2.2 million people worldwide and has faced numerous lawsuits and labor actions over the years. During the 2014’s Black Friday, labor unions staged pickets and strikes at 1,600 stores in 49 states. Unions are calling for the company to pay employees $15 per hour. The government has routinely sided with labor unions. In November 2013 the National Labor Relations Board said it had found that Walmart had pressured employees not to participate in strikes on Black Friday and had illegally disciplined workers who had engaged in strikes. Despite the complaints of labor unions and liberal critics of Walmart’s labor practices, the store, as the largest private employer in the United States, has dramatically affected unemployment. “Walmart is found to have substantially lowered the relative unemployment rates of blacks in those counties where it is present, but to have had only a limited impact on relative incomes after the influences of other socio-economic variables were taken into account,” an Oklahoma State University study found.